The Echo Input has a puck-like design that is just a third of the size of the Echo Dot. The bottom of the device has a rubberized texture. The Echo Input was designed to be a competitor to Google’s Chromecast Audio (which Google recently discontinued in January) but with the benefit of adding Alexa to your existing set of speakers. 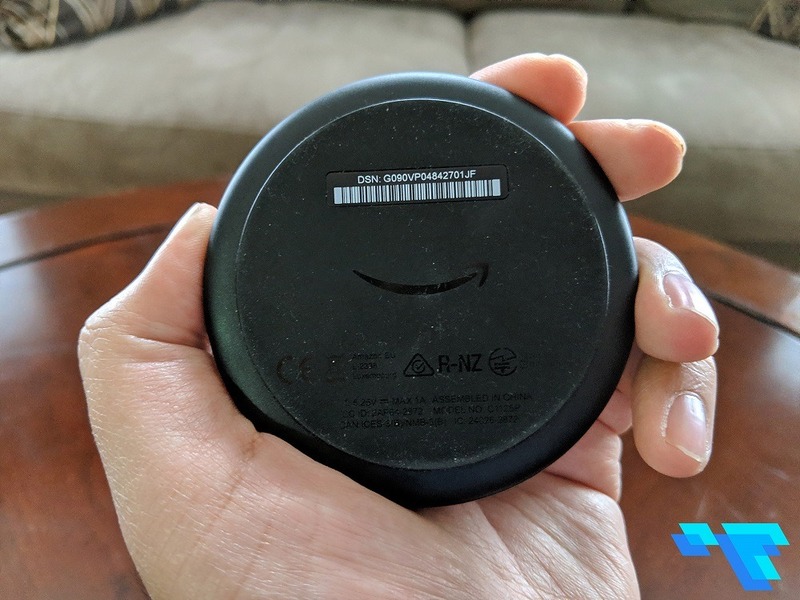 The device can connect to your speakers via Bluetooth or the 3.5mm audio cable that Amazon includes in the box, adding Alexa capability to an existing speaker quite seamlessly. The Echo Input can also easily be used to create a multi-room audio setup. 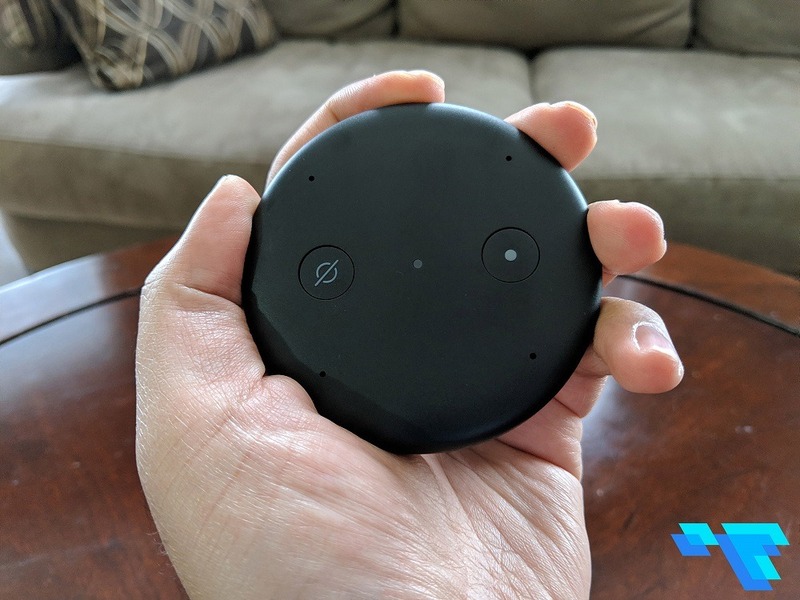 For example, you could have the Echo Input connected to your main speaker setup in say your family room and then a few Echo Dots or Echo devices throughout your home which will allow you to extend your music to some or all of the other Echo devices. The device comes with a four far-field microphone array with Echo’s Spatial Perception (ESP) technology. Even from across the room, Alexa was able to hear me most of the time – there were a couple of times where it couldn’t catch my voice, even though music was not playing. On the top of the Echo Input is the mic mute button and the action button to activate Alexa. Since there is no speaker, the only way to change the volume of the Echo Input is by asking Alexa. 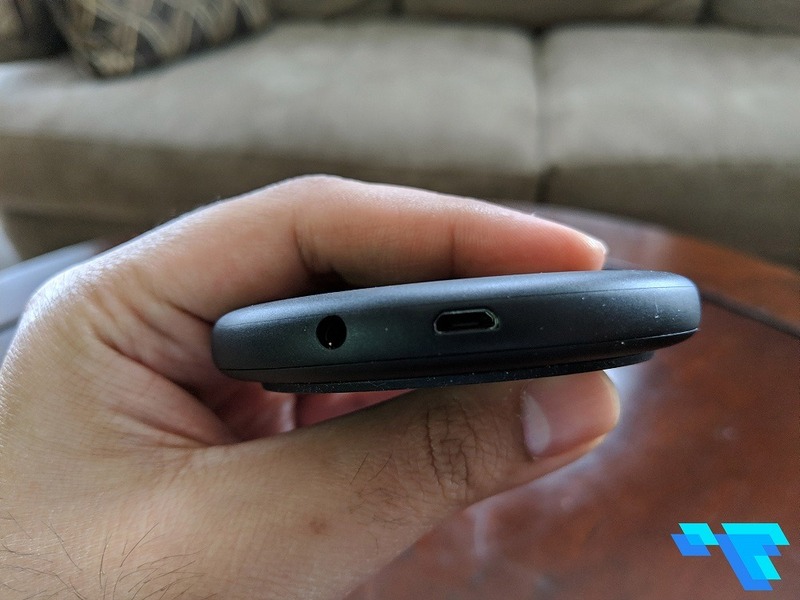 The back of the Echo Input has a microUSB port for charging and a 3.5mm headphone jack. Setting up the Echo Input takes about 10 minutes total, but I did have some issues during the setup process, which mainly had to do with connecting the device to Wi-Fi in the Alexa app. The Echo Input is available from Amazon.ca for $44.99 CAD and comes in Black and White. That makes the Echo Input $25 cheaper than the latest Echo Dot (at $69.99 CAD). Like other Echo devices, the Echo Input has Alexa built-in. Amazon claims that there are more than 10,000 skills currently available for their Echo devices including some Canadian specific ones such as Air Canada, TD, Telus, CBC, The Weather Network and more. You can also use Alexa to control your smart home devices such as Ecobee, Philips Hue and SmartThings. To add one or more of the many skills available for Alexa, you’ll need the Alexa app. The Alexa app is fairly easy to navigate but I faced some issues of long load times and menu items appearing twice, making a straightforward process a little convoluted. The app is divided into four sections, Home, Communicate, Play and Devices. Home is pretty self-explanatory. Communicate is where you can call, message or Drop In your other Echo devices or your friends and family’s Echo devices. The Play section allows you to control music playback on your Echo devices. The Devices part of the app is where you’ll see all your Echo devices and smart home products compatible with Alexa. It’s also where you can change settings for each of your devices. Overall, the Echo Input is a great addition to the Echo devices family and it’s an even cheaper way to enter Amazon’s Alexa ecosystem.